It’s been a Very Dry Wet Season. If you’re relying on collecting water from flowing springs, rivers and creeks for your only fresh water source this year, be prepared to find it hard work. Rivers flowing like this old pic of Twin Falls in the King George River are unfortunately something you wont see in the 2019 cruising season unless there is some significant rain in the last few weeks of the wet. But weather forecasts for the remainder of April show low winds and blue skies. Fantastic power boat weather. 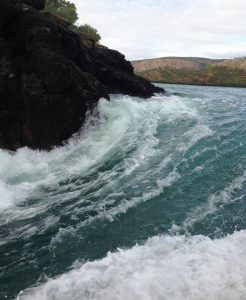 I’ve had 4 recent reports from KCCYC Members who are currently in the Kimberley on their boats. All say that the rivers and creeks are only just flowing. It’s likely that many normally reliable fresh water sources will be dry by mid dry season or earlier. Perhaps a water maker would be a good investment if you don’t already have one on board. Talk Fest Prompts New Private Forum for KCCYC Members Sailing in 2019. 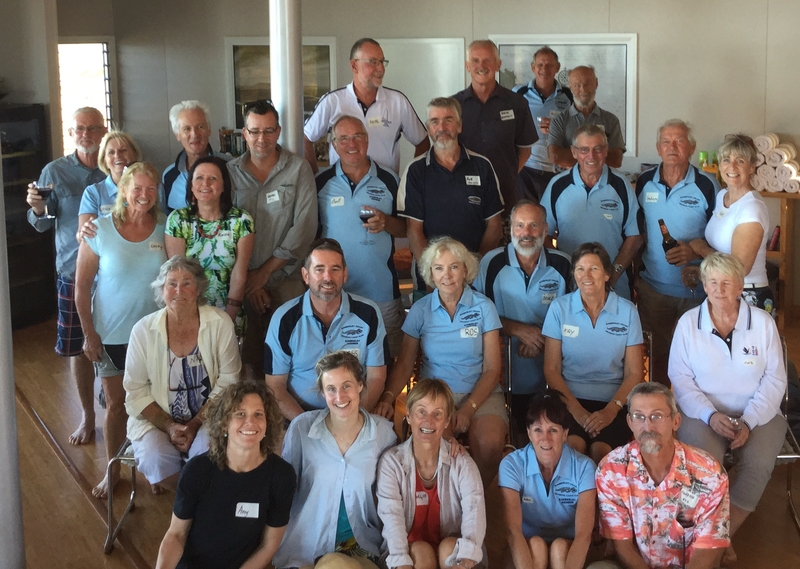 The 2019 KCCYC Perth Talk Fest was a great success, with over 40 Members and friends from about 20 vessels planning to leave Perth or nearby ports for the Kimberley Coast in the next few months. 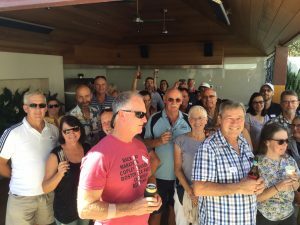 A common factor was that most were first time Kimberley sailors and were eager to share information and talk about their pending adventure. Many wanted the contact details of the others to keep in touch and to share information and experiences on their trip. Unfortunately, privacy concerns prevent the KCCYC sharing Members email addresses. This is a private group for owners, crew and friends of private vessels sailing to the Kimberley Coast in 2019. Only Members of the KCCYC will be invited to join this group. Even if you’re not sailing this year, other interested KCCYC Members can also be invited to join. 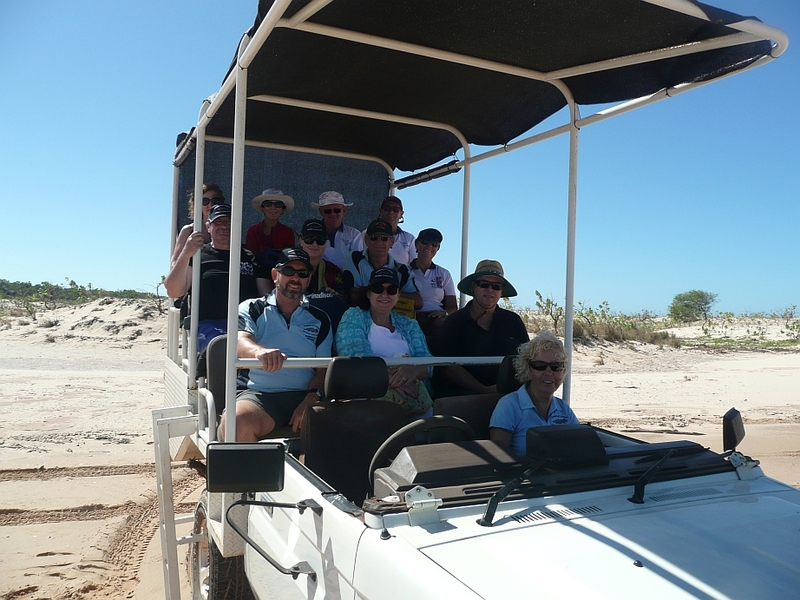 The group is specific to people interested in sailing to the Kimberley Coast on private vessels. Use the group to seek advice, share information, ask questions, answer questions, share costs on crew transfers and resupply in the Kimberley. You can post new topics to the group, reply to existing topics and view all other members topics. Arrange to meet up with other members on the water or get together before you leave for a chin wag. You can contact other members by email and communicate privately with them outside this group. Members email addresses can be viewed by other members of the group. You can control how this group contacts you by email. It can send you an email each time there is a new topic posted, or just a daily summery email, or send you no emails at all, or leave the group altogether if it no longer interests you. Unlike a normal public internet forum, the group is private and is not open to public viewing. You have to be a Member of the KCCYC and be invited to join the group. 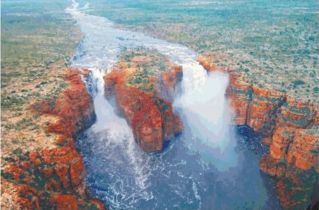 Planning your cruise to the Kimberley in 2019? Sailing to the Kimberley? Want to meet other skippers and crews for a chat over a few drinks? Join us on Sunday, 3rd March in Perth. Whether you’re planning your first trip, or an experienced Kimberley cruiser, come along and share your plans, pick up ideas & advice and meet like minded people. Contact Ross for Details. 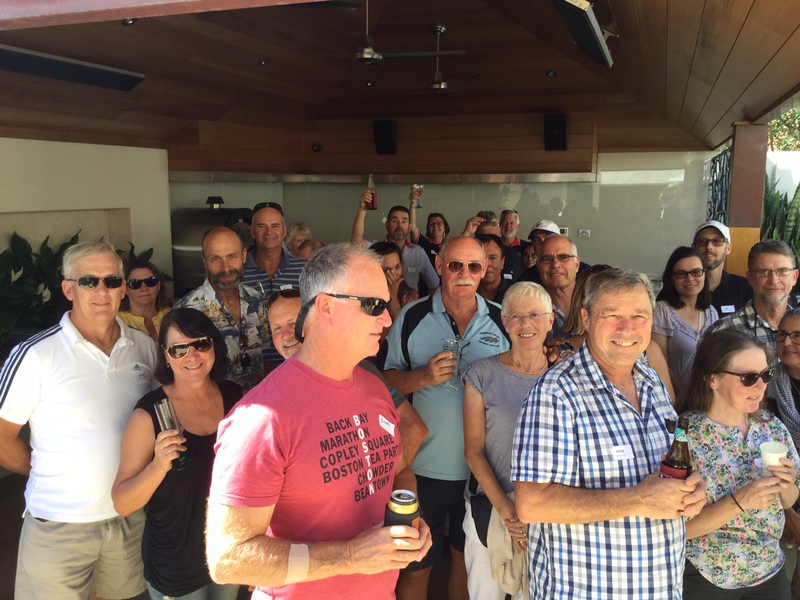 The fabulous and world famous Kimberley Coast Cruising Yacht Club Beach Party is on again in the 2019 cruising season. For all the incredible details on this magnificent extravaganza, click here. In recent years a number of Marine Parks have been established in the Kimberley Coast, and within the next few years, just about all the coastal waters from the Northern Territory border to King Sound will be included in these Marine Parks. The Lalang-garram parks include many popular places visited by cruising yachts, such as Montgomery Reef, Horizontal Falls, Deception Bay, Prince Regent River, Raft Point, Sampson Inlet, Kuri Bay, plus many more. 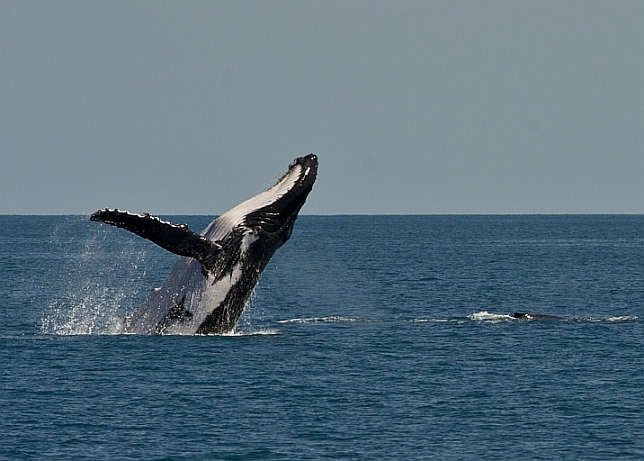 This area also has the best whale watching area in the Kimberley – Camden Sound. Similar to Queensland’s Great Barrier Reef Marine Parks, the new Kimberley coast parks will include special zones where restrictions apply,, including no fishing zones. The West Australia Department of Parks and Wildlife have produced a FAQ brochure, including a zoning map for the Lalang-garram parks. A pdf version of the brochure is available here. 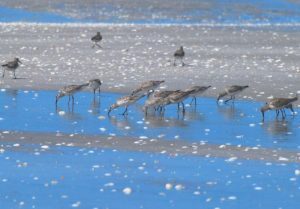 Eighty Mile Beach Marine Park. 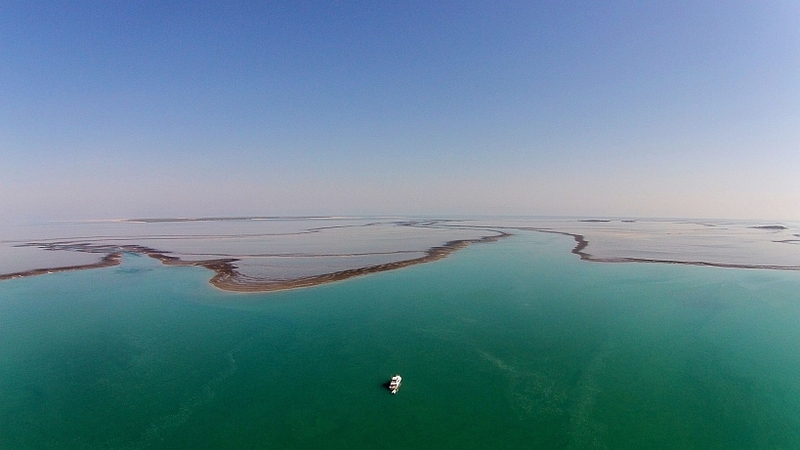 Many KCCYC members sail past Eighty Mile Beach en route between Perth and the Kimberley coast. Some may anchor off the beach, which, at 220 kilometers, is the longest uninterrupted beach in WA. The Eighty Mile Beach Marine Park zones have been gazetted and the fishing prohibitions that resulted from this zoning are currently in a transition period. The fishing prohibitions (exclusion areas) will take full effect from 6th October 2018. 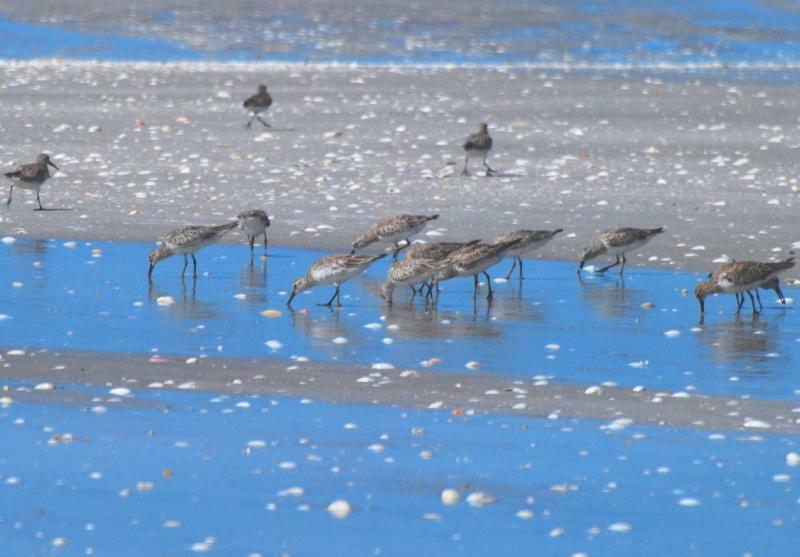 For more information on how these changes may affect your next visit to Eighty Mile Beach, please refer to this article. Latest Edition of the West Australian Cruising Guide now in a Free Download Version. Western Australian Cruising Guide, published by The Fremantle Sailing Club. This is regarded as the coastal cruising bible for WA. It includes many anchorages, routes, both in charted and uncharted waters, plus a brief history of many of the places you are likely to visit. It covers the whole of the WA coast, but is particularly relevant for the Kimberley coast. A pdf file, for reading on any computer, tablet or smartphone with Acrobat Reader installed. An ePub file, for use with e-readers such as Kobo, and any platform with software such as Adobe Digital Editions, or iBooks (Apple devices only). This will enable the guide to be read on almost any platform, including desktops (PC and Mac), laptops, tablets (ipad etc. ), android phones and iphones. Misinformation being spread about Fuel at Dog Leg Creek. Loading Fuel from the dumb barge at Dog Leg Creek. We’ve heard that someone has been spreading misinformation about the fuel barge at Dog Leg Creek not opening this dry season. 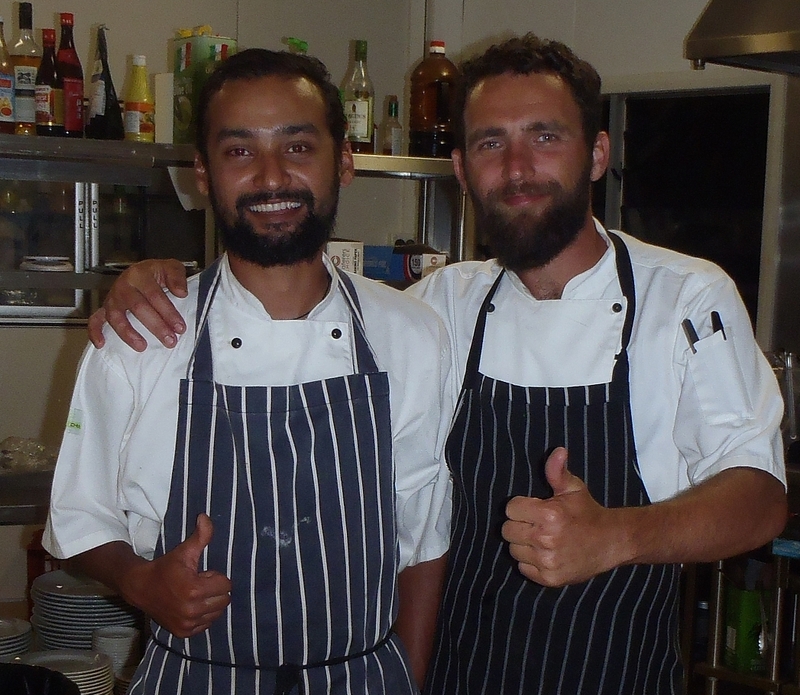 We can definitely confirm the rumour is false, and that Dean Kemp and his team will certainly be open for business as usual throughout the 2018 dry season, and for many more dry seasons to come. Fuel Availability along the Kimberley Coast and across the top end from Cairns to Darwin. Change to the East Kimberley Paid Permit System. 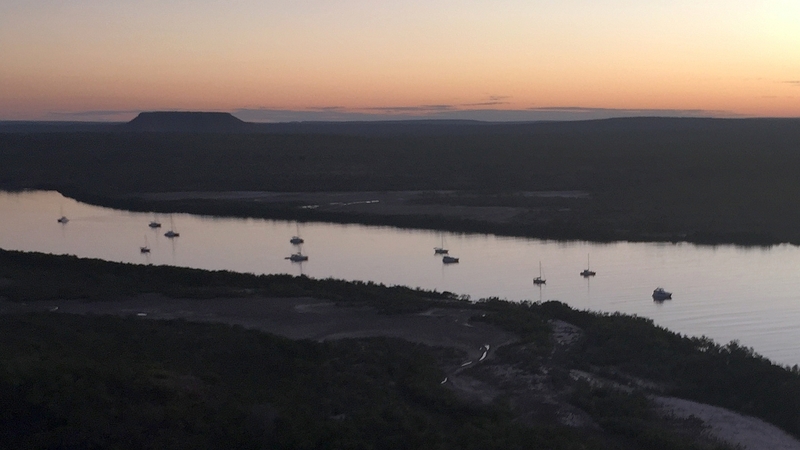 We reported earlier in 2017 about the introduction of a permit system for crew on private vessels who wish to go ashore on the Kimberley coast between Truscott Air Base and the Prince Regent River. The permit has been changed from 10 consecutive days to 30 consecutive days from a predicted start date that you must nominate when you purchase your permit. 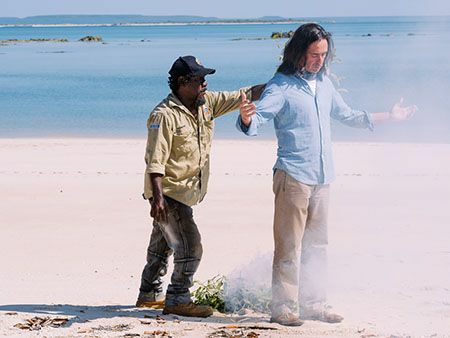 Image from the TV series “Coast Australia” taken in Wunambal Gaambera Country. Permits can only be bought online. If you buy a permit well in advance, and don’t make the dates you specify on your application, your permit is worthless. We argued for the permits to be for 3 months, which gives boaties flexible sailing plans, allowing for the unforeseeable weather and boat gremlins that seem to find us boaties. We pointed out that short, set date permits are likely to lead to noncompliance, with the inevitable result of confrontation between rangers, and boaties who are simply unable to comply with the unreasonable time limits. We also argued that short, set date permits are likely to create a culture of non-compliance. If boaties believe they cannot comply with the dates, they simply won’t bother to buy a permit. Word of mouth will then spread through the yachtie forums and yacht club scuttlebutt, to the point where many vessels will choose to ignore the permits. The Wunambal Gaambera Community Management have since decided to extend the permits from 10 to 30 days. Although this is a positive move, we believe 30 days is still too difficult to comply with, given the many unforeseeable quirks involved in long range cruising plans and schedules. The KCCYC will continue to lobby for a longer permit time. The KCCYC attitude regarding paid permits for going ashore along the Kimberley coast, is that a reasonable fee to visit and see such magnificent places, is no different to paying a reasonable fee to visit and see national parks, or other natural attractions around the world. The Wunambal Gaambera people own this land, and if you disrespectfully ignore their permit system, it can be likened to entering a farm without the farmers knowledge or permission – something that most of us would never consider doing. We also consider that there should be 1 permit system covering the whole Kimberley coast, as opposed to multiple permits for various areas along the coast. 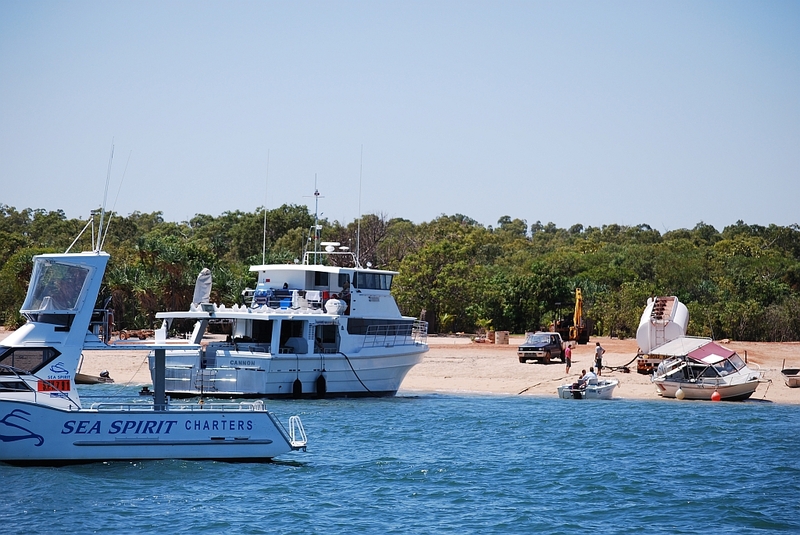 There are currently 3 separate permits required to go ashore along most of the Kimberley coast cruising grounds. Two are free, and the above permit has a cost. A single permit system is only likely to result from state government intervention, so we aren’t holding our breath. Information on the 3 permit systems is available in the General Information leaflet in the Anchorages Page. We encourage you to comply with all 3 permit systems. They are easy to obtain and relatively inexpensive for the privilege of accessing such a beautiful place. EPIRB Signal Failed to Reach AMSA Search and Rescue. The beautiful Abrolhos Islands in WA. A number of critical things happened during the incident. Some of which could have led to a very different and sad outcome. The guys were wearing wet suits that helped to keep them buoyant. They all managed to retrieve life jackets from the upturned vessel, but later commented that the cheap foam like jackets were very uncomfortable to wear. The tender’s EPIRB, which was purchased new 4 months earlier, was activated, but AMSA later officially confirmed that they did not receive a signal from the beacon. The EPIRB was later tested by the manufacturer. They found that technically the EPIRB met its expected transmission performance. However, when the EPIRB is activated to ‘on’, should it then be moved to ‘off/test’ then to ‘on’ again it appears to go back into a reoccurring GPS test mode where it’s not transmitting, despite being activated to the ‘on’ position. Clearly, in a stressful and life-threatening situation such as this, pushing the on and off buttons on an EPIRB, either unintentionally, or on purpose to be sure it is activated, should not be considered abnormal. AMSA have been notified of this “function” in this EPIRB. If there is an outcome from AMSA, I will endeavour to report it in a future newsletter. When they saw the cray boat passing by, they let off one of the smoke flares, but when it became obvious that the cray boat had not seen the flare, one of the guys climbed on top of the upturned vessel and frantically waved a dive fin and life jacket. They decided to let off the second smoke flare, but it failed to ignite. Luckily, one of the fishing boat’s crew saw the waving jacket. They were returned to the mother vessel and immediately motored to Rat Island for medical assistance for their seriously injured friend. The Silver Chain nurse based on Rat Island gave them medical advice by phone during the 12-mile passage. An aircraft on Rat Island was commandeered to fly the injured man to Geraldton. At the point of take-off, the nurse called for the pilot to abort the take-off to pick up a defibrillator, as the nurse believed he had gone into cardiac arrest. With the plane door quickly opened, the defibrillator was passed through and applied. The plane then transported him to Geraldton with the nurse providing ongoing medical assistance. The man’s injuries were too substantial to be dealt with at a regional hospital and he was ventilated and placed into an induced coma before being flown by the Royal Flying Doctor Service to Royal Perth Hospital. Thankfully, he has fully recovered from his injuries. The wreck of the 7M centre console tender washed ashore. When operating in remote areas look at investing in some form of GPS tracker (ie Spot Track or the new Garmin, Inreach SE or Explorer). The cheap, foam life jackets are incredibly uncomfortable and I would invest in proper pdf type 1 jackets if possible and only use inflatable ones in addition. Safety equipment needs to be stored in a location that is accessible in a capsizing incident. Carry additional flares other than the minimum. My personal take from this report is firstly, that these guys are amazingly lucky to be alive. Secondly, is that I have the basic minimum safety equipment required by law on my tenders, which I will be reviewing. Thirdly, is that Ros and I are getting to the age where a defibrillator on board our mother vessel may be a wise investment – we may not use it, but there are plenty of people on the water older than us that may need it one day. Something we have been doing for years when the 2 of us go ashore by tender in the Kimberley, is carry a satellite phone, a hand-held VHF radio and a personal EPIRB in addition to our tender’s own fitted EPIRB. If you think about the lack of water and food in these extremely remote and inhospitable locations if your tender becomes immobile, or you suffer serious injury and can’t move, these easy to carry items become very cheap insurance. 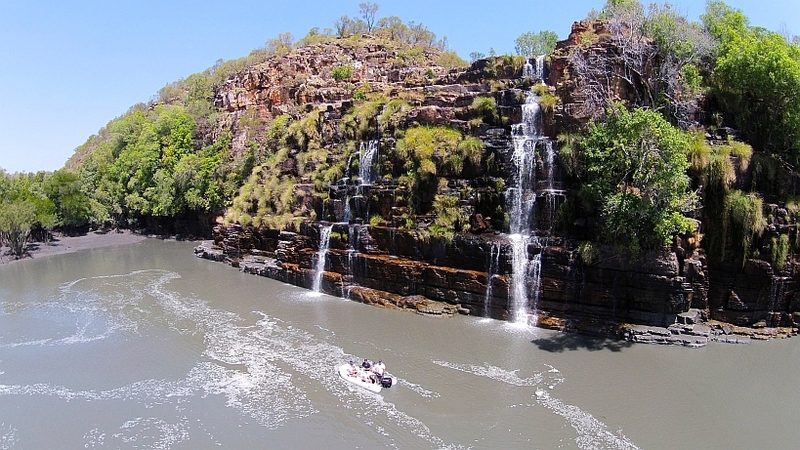 New Paid Permit Required to go Ashore in the East Kimberley. The Wunambal Gaambera People hold native title over a large stretch of the Kimberley coast from Vansittart Bay in the east, to the Prince Regent River area in the west, including the coastal islands. Effective from May 2017, they introduced a paid permit system for all visitors who enter their land or islands from boats, aircraft or 4WD. This includes owners/crew on board privately owned cruising vessels, as well as guests on commercial charter fishing and sightseeing vessels. The permits can only be purchased online from the Wunambal Gaambera website. 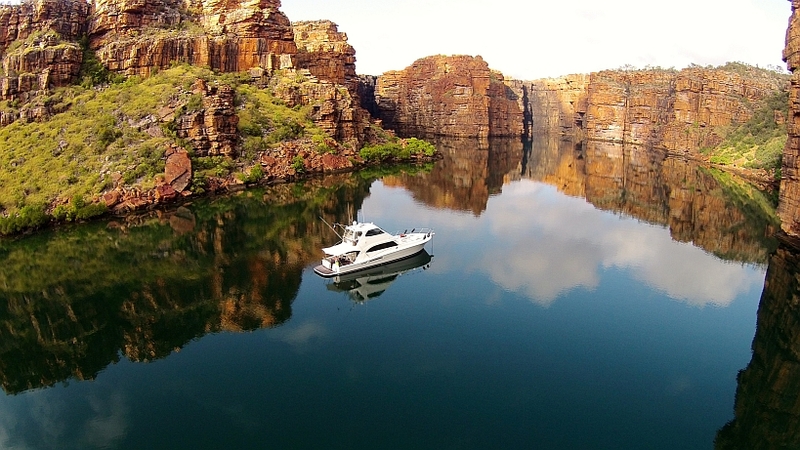 If you don’t have satellite internet facilities on board your boat, you need to purchase the permits before you enter the Kimberley coast. There are no mobile phone or internet facilities available in the area. A permit is required for each person on board your boat. The permit only allows access to the 50 locations shown on the maps available on the Wunambal Gaambera website. Effectively there are only 36 locations that can be visited by boat, the remainder are by 4WD or aircraft access. A GPS lat/long for each location can be downloaded from the Wunambal Gaambera website. If you click on the icon for each location on the map in the Wunambal Gaambera website you will be linked to a short description of each location along with a google map showing the exact location. To help find the locations when you get there, you should print, or save these information pages as a .pdf while you have an internet connection. These paid permits are in addition to the free Aboriginal Land Trust (ALT) permits also required to go ashore in many parts of the Kimberley. KCCYC Members – download the General Information leaflet from the Anchorages page in this website for details about obtaining the ALT permits. 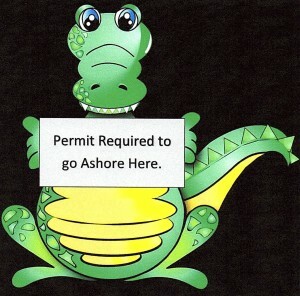 If you do not intend going ashore, you are not required to buy a permit. Its unclear if the inter-tidal zone is covered by the permits, but my understanding is that tidal creeks and beaches up to the high water mark are currently OK to visit without a permit, but not above high water mark. Also see the newsletter article below Visitor Permit System will now be Enforced. Hugh 2017 Kimberley Wet Season means Spectacular Early Dry Season Cruising. This photo in a February 2017 edition of the Weekend Australian, data from the BOM and first hand reports from Kimberley locals confirm that the Kimberley is having a very wet, wet season, with near record rainfall. This means that the rivers, creeks and waterfalls will be in full flow, probably for the first few months of the dry season, and not likely to start substantially slowing until late May, or even into June. For those of you sailing there early in the season, there will be some spectacular sights, particularly in places such as the King George and Berkeley Rivers. Be aware that the full flowing rivers also bring some hazards for the unwary sailor. will be washed down the rivers into the ocean, including logs and whole trees. Trees with branches still attached are relatively easy to spot, as they generally have sea birds resting in the branches. But logs can be hard to spot, and hitting a log is not fun. If possible, avoid sailing at night near the coast, and always keep a lookout ahead for floating or partly submerged logs. The water will be muddy, making spotting a brown, partly submerged log hard to see. River sand bars and channels will have been washed out and could have moved course. Expect the bar crossings and channels to be different from previous year’s routes. Do not rely on charts or cruising guides when entering large rivers with shallow bars. This also applies to the KCCYC Anchorage pages. Hopefully, early in the season, some of our members will feedback changes to routes and waypoints, allowing us to update the Anchorage pages. We will make special reference on any waypoints or route updates applicable to this year. 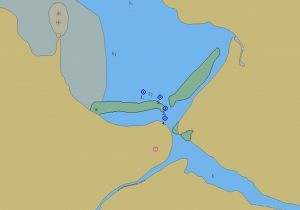 So unless you see such references in an Anchorage, don’t expect the published waypoints or routes for the large rivers to be reliable. If you are unsure of a bar crossing, anchor off, and survey the crossing in a tender before committing your yacht. And always cross river bars on a rising tide. Crocodiles will be hard to spot. Muddy water will make spotting crocs more difficult. Take particular care when getting in and out of tenders at shore and don’t stand in shallow dirty water near your tender. Dont even consider swimming in the salt water, and be very wary about swimming in fresh water holes, as the high river levels will mean that crocs will have travelled into fresh water creeks and holes that may normally be considered safe to swim. Visitor Permit System will now be Enforced. Details of of the DAC Visitor Permit System are available from the DAC website http://www.dambimangari.com.au/ They include a map, a schedule of permitted landing places with Lat/Long coordinates, a Code of Conduct and details about the Act covering the permit system including possible penalties for breaching the Act. Another important fact is that the visitors permit does not give you the right to visit anywhere you like in DAC country. The schedule of permitted landing places published in the DAC web site details the locations the permit covers. All other places, which is the vast majority of DAC country, are no go ashore areas. Its unclear if the inter-tidal zone is covered by the permits, but my understanding is that tidal creeks and beaches up to the high water mark are currently OK to visit, but not above high water mark. 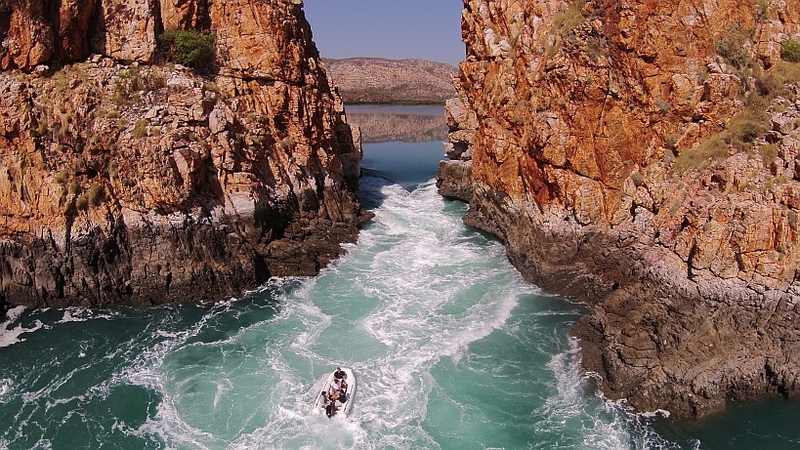 There are many other areas of the Kimberley coastline that require a visitors permit to go ashore, but at this time DAC country is the only part of the coastline where visiting ashore is restricted to certain locations. This is likely to change over coming years. I urge visitors to be respectful of the rights of Native Title ownership over the land. Failure to obtain a visitors permit can be likened to stopping your car on a country road, jumping a farmers fence and going for a walk to explore his farm without the farmers knowledge or permission. How to get a permit. Permits are obtained free over the internet from the Aboriginal Land Trust website. Download the General Information leaflet in our Anchorages page for links to detailed information, maps and the application form. You only need a permit for your boat, but you must list the names of the people travelling on the boat in the application form. There are 14 different reserves that require permits bordering the Kimberley coast between the Northern Territory border and Broome. 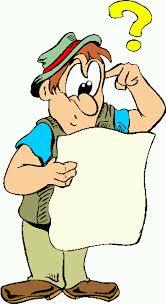 An example of what to include in a permit application is detailed in our General Information leaflet under Anchorages. The General Information leaflet will be updated if we become aware of changes to the permit system. Shifting Sand Bar to the King George River Entrance. I have had 2 reliable reports that the sand bar outside the mouth of the King George River has shifted, and waypoints used in previous crossing may not be relevant. The King George River Anchorage in the KCCYC website has been updated with the below waypoints for entry through the sand bar. This chart shows the above waypoints. Note that there appears to be a distinct dogleg in the route, whereas previous dry season routes have taken a relatively straight course between the sandbars shown in green on the chart. In other words – The sandbar has shifted from the official chart position. This can also be seen on the Google Earth photo below, which is dated May, 2016. Fuel at McGowan Island will no longer be available. Unfortunately, the people that are leaving McGowan, are also the people that will give you a lift into Kalumburu to meet an aircraft for crew transfer, or to buy supplies at the shop etc. But try Honeymoon Bay Camping Ground for a lift into town. 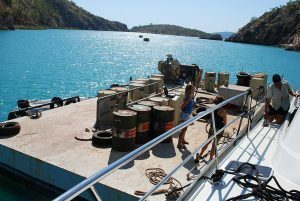 Other than Wyndham, the alternative source of fuel in the East Kimberley is from Shore Barge, who run a fortnightly barge service from Darwin to Truscott Air Base and Kalumburu. Their Darwin phone number is 08 8932 3344 Monday to Friday. [email protected] The last time I purchased fuel from Shore Barge was in 2010, and it had to be ordered and paid for in advance. I don’t know what their current policy is, so I suggest you make your own enquiries well in advance. One thing I do know for certain, is that you need to be there on the day they arrive from Darwin to unload your fuel from the barge, as they sail to a schedule, and will not wait for latecomers. Another alternative for large vessels only is from a Paspaley Pearls mother ship. Their policy is that orders must be minimum 5000 litres and they need plenty of advance notice so the fuel can be loaded on board before their ships leave Darwin or Broome. I can provide the contact details for the person to talk to at Paspaley Pearls. Please contact me via the Contacts page. Paspaley’s do not normally sell fuel, so please do not approach their mother ships in the pearl farms expecting to buy fuel. Fuel Distributor at Port Hedland wharf accept BP Fuel Cards Only. If you are expecting to buy fuel at the fuel Wharf in Port Hedland, please be aware that one of our members has just notified me that they will only accept BP Fuel Cards for payment. They accept no other form of payment. Fortunately, Ken and Linda, on board “Endless Summer”, have sufficient fuel on board to reach Broome. Thanks for the heads up Ken and Linda. This item was posted 17 May 2016. Early Visitors to the Kimberley are Reporting Dry Conditions. Cause for Concern! KCCYC members who are currently sailing the Kimberley coast, and those who recently returned from the coast, are reporting very low creek and river water flows, stemming from lower than usual rainfall this 2016 wet season. This is cause for concern for crews on vessels that don’t have a watermaker on board, and intend gathering water from these normally reliable water sources for their drinking and washing water. You should be prepared, by taking plenty of water with you, or consider investing in a water maker. Late rains are still possible, which may boost the creek and spring flows. But don’t rely on this happening, because it’s unlikely to rain heavily enough to make much difference at this time of year. If you have just been out, or are sailing to the Kimberley shortly, please provide me with feedback on the creek levels in the areas you visit, so I can update this information to other members. Please use the Contact page. Update – 15 April 2016. After posting the above article yesterday, other KCCYC members have contacted me, confirming that normally reliable fresh water creeks and springs have already dried. Freshwater Bay creek in Vansittart Bay, Water Pipe Bay in Swift Bay, Gallery Bay creek, most of the waterfalls in the Berkeley River (except Casurina creek), and Kunmunya creek in Augustus Waters, are some that were reported as dry, or near dry. 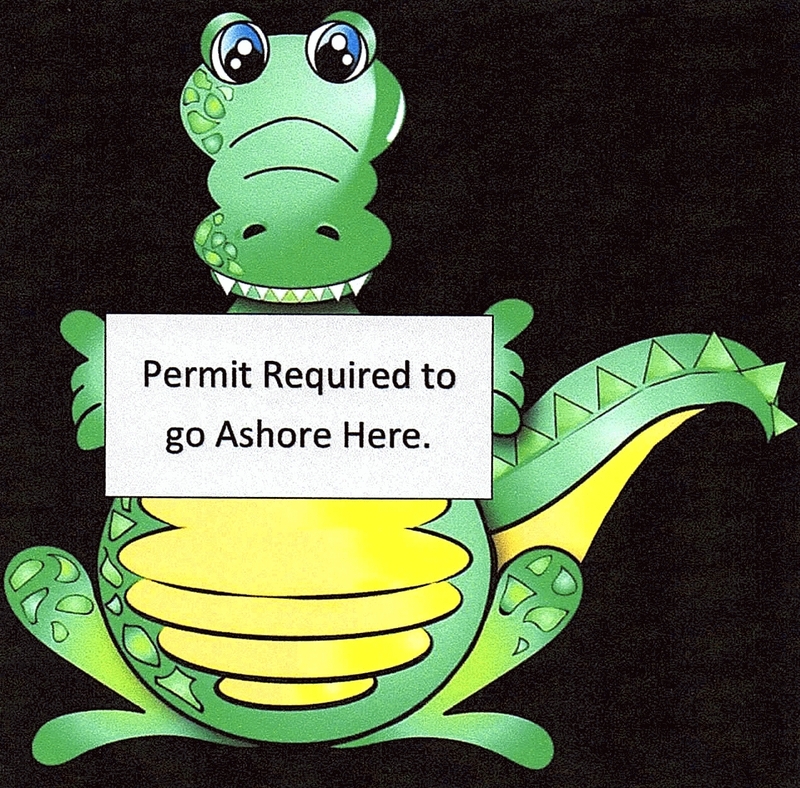 Permits are Required to go Ashore in Kimberley Waters. 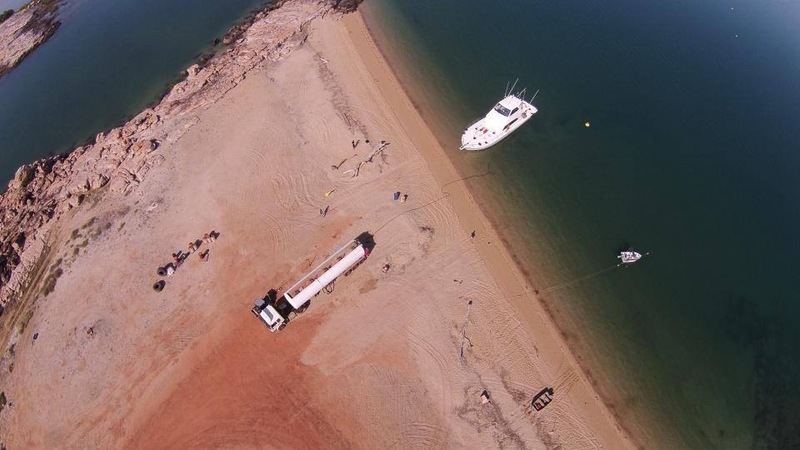 Permits from the Aboriginal Lands Trust (ALT) for yacht crews to go ashore in several places along the Kimberley coast have been a requirement under WA law for several years. But in the past, most crews have been unaware of the permit system. Things are changing in the Kimberley coast. 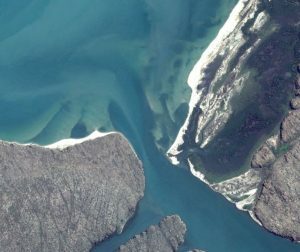 The WA Department of Parks and Wildlife have established the Lalang-garram / Camden Sound Marine Park, and the Horizontal Falls Marine Park is not far from being set in law. 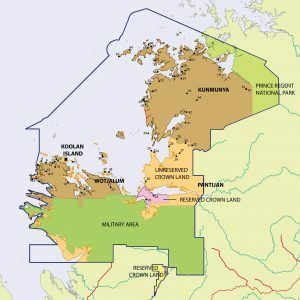 Also, much of Kimberley coastal land and islands are now under Native Title ownership, and the indigenous communities are in the process of introducing permit systems for boat crews who wish to go ashore on community owned land, which is most of the coast and islands commonly visited by cruising yachts. These local community permits are unlikely to be introduced in 2016, and when they are introduced, we will inform our members. I believe there will be a change of attitude towards boat crews who decide to disrespect the Indigenous land owners by going ashore without permits in certain places, and it’s possible that we’ll see a start to enforcement of the ALT permit system. This is not cause for you to panic if you haven’t got a permit and you’re already on your way to the Kimberley on your boat. It’s highly unlikely you will be asked for your permit. But for the sake of 20 minutes on the internet to obtain these free permits, if you can, I suggest you do so. How to get a permit. Permits are obtained free over the internet from the ALT website. Download the General Information leaflet in our Anchorages page for links to detailed information, maps and the application form. You only need a permit for your boat, but you must list the names of the people travelling on the boat in the application form. 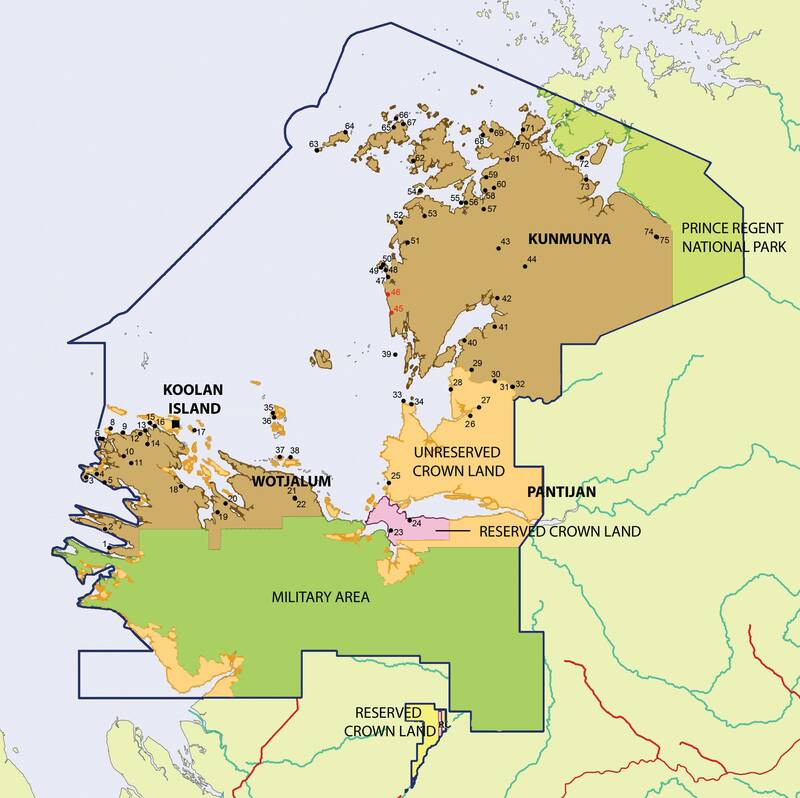 There are 11 different reserves that require permits bordering the Kimberley coast between the Northern Territory border and Broome. An example of what to include in a permit application is detailed in our General Information leaflet under Anchorages. The General Information leaflet will be updated if we become aware of changes to the permit system. Phil is back at Silver Gull Creek. If you’re Kimberley coast sailing this year, one of the absolute must visit places, is the Squatters Arms at Silver Gull Creek in Yampi Sound. Phil enjoying the tank at Silver Gull Creek. After a few years away from Silver Gull, Phil, the original “Squatter,” is back home – at least for the 2016 dry season. I recently spoke to Phil by phone from his yacht, “Scot Free II”. He was anchored out the front of SGC, and he’s looking forward to having a beer and a chat with yachties who call in for a swim in the tank. This little piece of tropical paradise is a great spot for a BYO lunch and drink, with plenty of plastic chairs and tables to sit around, al fresco style. And the tank, with a constant supply of spring fed fresh water, is a swimming pool you will remember for life, so take your bathers. It costs nothing but good humour and a friendly attitude. Enjoy a beer and a chat with Phil in the shade at Silver Gull Creek. But pack your wallet if you want to take home souvenirs found nowhere else, such as a SGC tee shirt, stubby holder or life membership to the “Squatters Arms Yacht Club”. 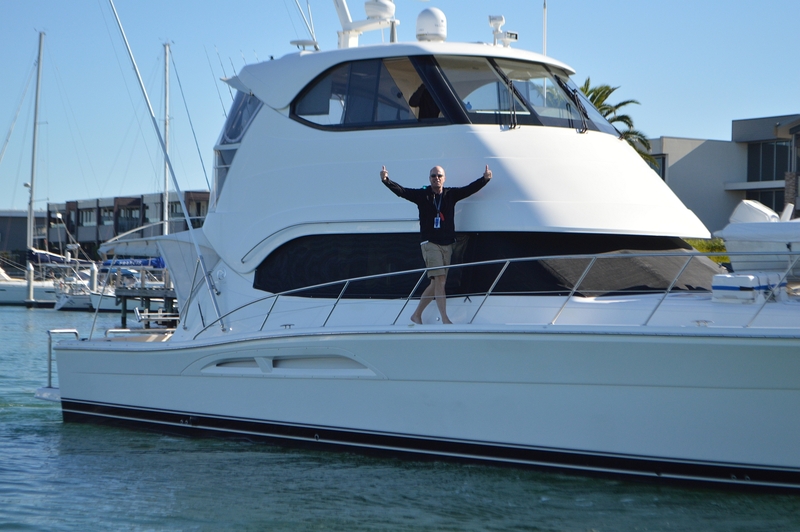 Before you dinghy back to your yacht, ask Phil for the “Silver Gull Salute” – a real treat that shouldn’t be missed. Courtesy dictates a call on VHF16 before you head up the creek to the Squatters Arms. Call sign “Silver Gull Creek”. The creek near the Squatters Arms dries at low tide, so head up stream after about half rising tide, and make sure you are out before half ebbing tide, or you’ll have to spend the night there. And keep an eye on your dinghy when its tied to Phil’s landing area – the tides there are big. Your’re invited to the 2016 Annual Beach Party at the Berkeley River. 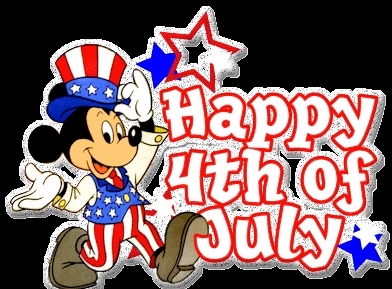 It’s not common knowledge, and you probably don’t know about it, but July 4th is a public holiday on Kimberley coast waters. So do what the Americans do and make a long weekend out of it – sail up to the Berkeley River for a few days relaxing in the sun and join our stupendous celebration. Trust me, it’s not far! To get the real facts, and all the details, click here. Join us for a drink and a chat on 6th March, 2016. Sailing to the Kimberley? Want to meet other skippers and crews for a chat over a few drinks? Join us on Sunday, 6th March in Perth. Whether you’re planning your first trip, or an experienced Kimberley cruiser, come along and share your plans, pick up ideas & advise and meet like minded people. KCCYC members and non members welcome. Contact Ross for details. 2015 Annual Beach Party at the Berkeley Lodge another great success. The 11 boat party fleet anchored up near the mouth of the Berkeley River at sunset with Mt Casuarina in the background. 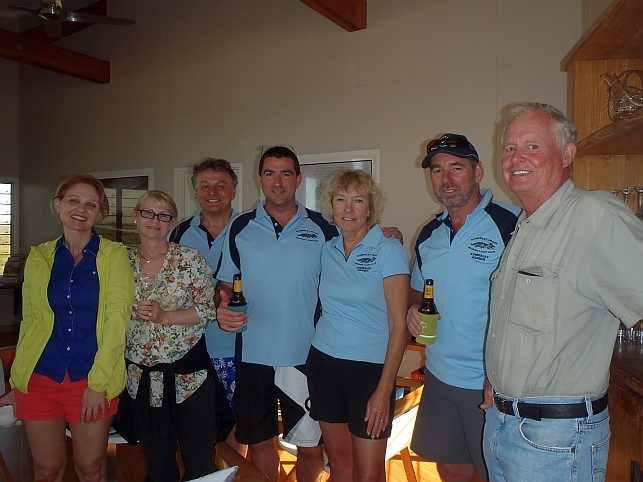 The Skippers and Crew at the 2015 Annual Beach Party. The team at the Berkeley Lodge did a fantastic job of looking after us. And our secret, deep pocketed sponsor managed to lighten his or her credit card, with drinks from the Lodge’s well stocked bar flowing amply and freely. The Lodge’s chef’s excelled again this year, creating a delicious desert eagerly enjoyed by all. The Berkeley Lodge’s “Kimberley Limo” picked up and returned party goers to the beach near the river mouth. New friends were made amongst the various vessel’s crews, and judging from the chatter, cruising in company and more than a few sundowners were discussed and planed for the coming weeks, as most skippers were heading west to experience more adventure, fun, fishing and magnificent scenery along the Kimberley coast. 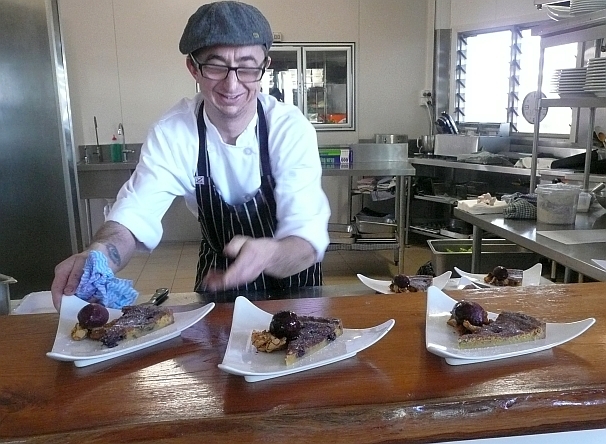 The Berkeley Lodge’s chefs created a delicious dessert. Thanks guys. 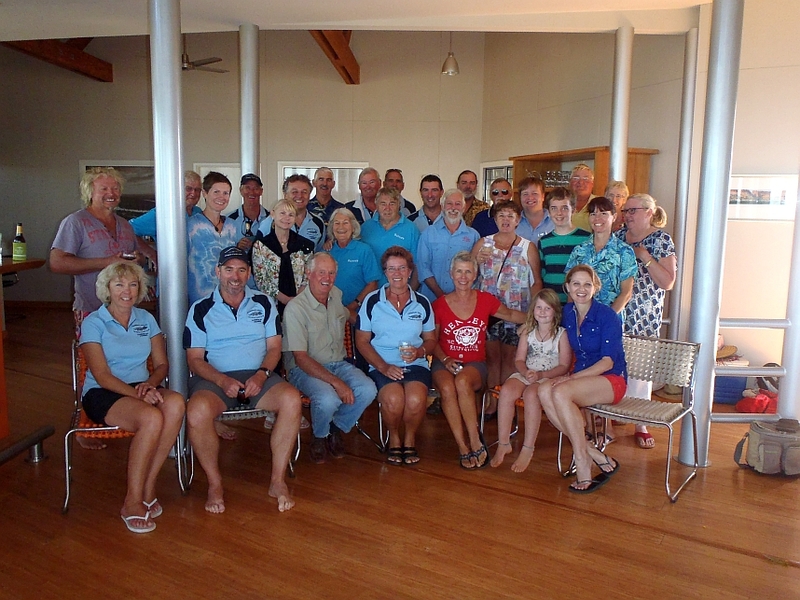 Going by the feedback I get from KCCYC members, 2016 looks to be a big year in the Kimberley, with many skippers from various Australian ports planning a cruise. The 2016 Annual Beach Party is likely to be in the first week in July again, so if you’re coming up, try to make it to the Berkeley River for what’s probably Australia’s most remote and difficult to get to party. You won’t be disappointed. A special thanks to the Berkeley Lodge crew for hosting a wonderful day. We Made It!! “Prime Mover” arrives home in Melbourne. “Prime Mover” at the Kimberley’s famous Twin Falls in the King George River. Andrew arrived home in Melbourne in May, 2015 after a year long trip over the top – east to west. We met Andrew via VHF in the Kimberley last year, then again face to face in Cullen Bay Marina, Darwin before he resumed his trip back into the Kimberley and down the west coast. The crew from “Prime Mover”. Getting Fuel on the Kimberley Coast for Your Vessel in 2015. 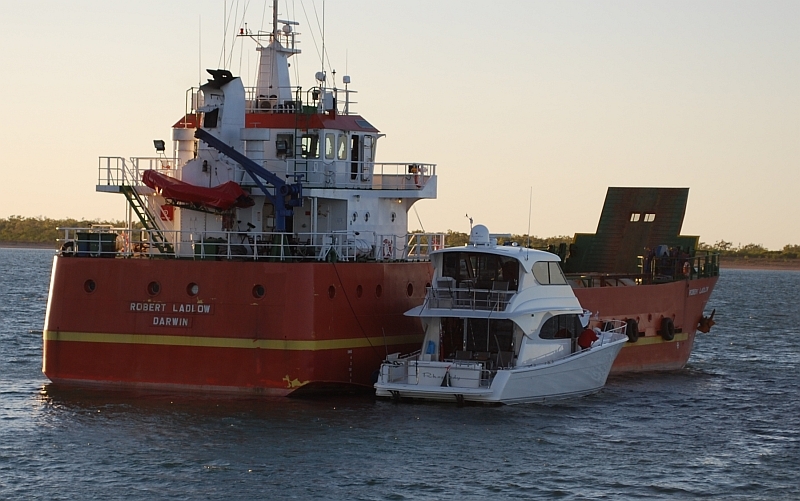 Cruising vessels on the Kimberley Coast in 2015 need to let the fuel suppliers know they are coming. Contact them by phone before you leave Darwin or Broome and tell them roughly when you’ll be taking fuel and approximately how much fuel you will need. It’s also good practice to call them again about a week out from your ETA to confirm. and if you turn up without notice expecting to load thousands of litres of diesel, you may be out of luck. Fuel Tanker at McGowan Island Camp, Napier Broome Bay. Depending on circumstances, it can take weeks for them to get the next barge load of fuel out to these very remote places. For contact details on where to get fuel in the Kimberley coast, download the Fuel in the Kimberley pdf from our Anchorage pages. Paid Visitor Passes are not far away, if you want to go ashore in the Kimberley. The Dambimangari area, which includes the Kimberley coast and most of the coastal islands from around the Prince Regent River in the east, to Cone Bay in King Sound in the west. This system is in its final stages of planning, and it’s expected to be introduced in 2016. A draft copy of the Dambimangari Visitor Pass System is available here. When this Visitor Pass System is finalised, passes will be available on the internet, and the KCCYC will provide the relevant contact information to members. Included in the above draft, there is a location map showing where the permit system will allow visitors to venture ashore. Additional locations will be considered by making an application on the this form. If you are aware of land based attractions you would like to include in the visitor pass system, please complete the form and forward it to the address on the form. The Wunambal Gaambera area, which includes the Kimberley coast and most of the coastal islands from Truscott Air Base in the east, and almost to the Prince Regent River in the west. A draft copy of this system has not been made publicly available at this time. It’s expected that this permit system is likely to be introduced in 2016 or 2017. The KCCYC will provide information to its members, as it becomes available. Please note that the visitor Pass Systems only apply to the land and islands. The public have free access to the waterways up to the high tide mark, including the sea, rivers, creeks, tidal inlets, bays, estuaries and harbours. Recreational fishing is not affected in these waters; however the Lalang-garram / Camden Sound Marine Park covers a large part of the sea in the Dambimangari area, and special fishing zones and whale watching rules apply within the park. Click here for the Parks and Wildlife website. Navigation Update. Paspaley Pearls re-open Port George IV Pearl Farm. Lines of Pearl Farm Floats. The farm takes up most of the west and northern part of Port George, and may also take up the larger bays in the east side of the Port. For skippers who are yet to experience sailing around a pearl farm, you should read the General Information page in our “Anchorages”. Normally the farm boundaries are well marked with radar reflecting buoys spaced about 500M to 1000M apart. In rough weather the black plastic floats supporting the pearl lines are very hard to see, and at night they are impossible to spot. Most radars will not pick up the lines of plastic floats. Take special care when sailing around pearl farms, and do not sail around them at night. Your’re invited to the 2015 Annual Beach Party at the Berkeley River. No doubt you’ve heard about, or seen the Giant Diver puppet and his Niece (recently in Perth). 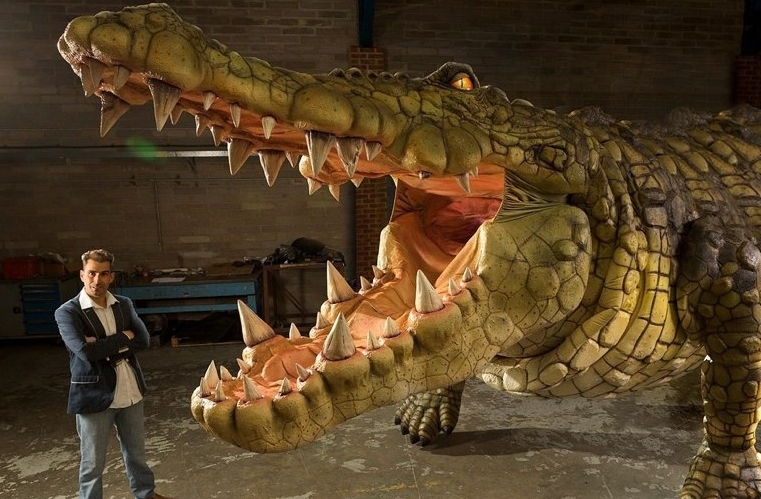 In keeping with our Kimberley theme, and at huge expense to our secret, deep pocketed sponsor, we’ve commissioned a Giant Crocodile puppet. Would you like to be involved in a little “Citizen Science”? – Kimberley Moth Project. 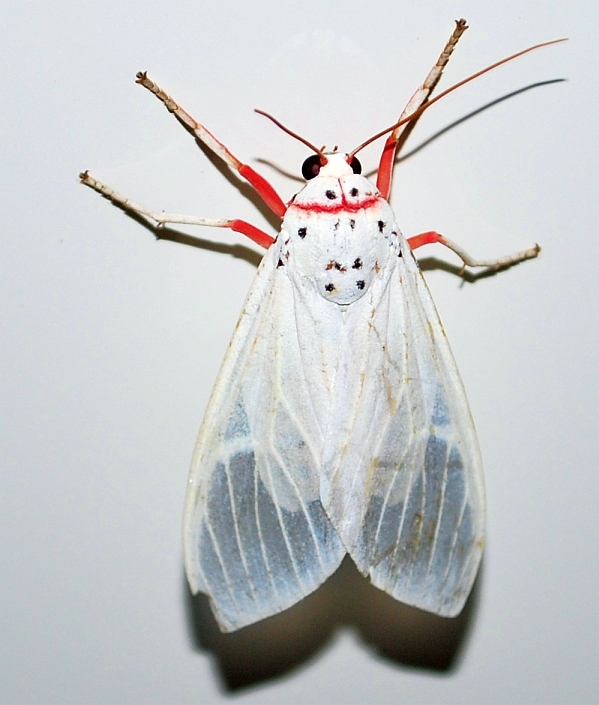 Mark Heath, a Perth natural scientist, is compiling a detailed study of West Australian Moths. He asked if any KCCYC Members sailing our northern WA waters this year would participate by collecting moths on board at night, and posting the specimens to him, detailing where they were collected. Mark believes there is the potential for many species never seen before and new to science. Those who take part will be fully acknowledged in any publications. He gets the specimens identified by DNA barcoding, then the specimens are deposited at the Australian National Insect Collection at Canberra and the WA Museum. Drone helicopter adds a fantastic dimension to sailing photography. KCCYC Kimberley Member, Hamish Beck sent me these photos from his recent Kimberley trip on board his Riviera 60, “Queste“. or send it over the mangroves to discover if a creek is worth exploring, or fly over a shallow river bar to see where the deepest channel is. Fuel tanker at McGowan Island. These photos were taken from a small remote controlled drone quad prop chopper with its own quality camera and gimbal attachment. The camera takes HD video and 14 megapixel stills. Phil (ex Silver Gull Creek) is back on the water. We were walking along the jetty at Cullen Bay Marina in September and spotted Phil’s unmistakable white and woolly features. He was sitting in a yacht cockpit, deep in study of one of the vessel’s manuals. “Scot Free II” at Cullen Bay Marina. Expect to see her and Phil anywhere in northern waters. We were chatting to him at Marion’s funeral about a month earlier and he said he was heading up to Darwin to look for a yacht and get back out on the water. I don’t think anybody, including Phil, expected it would happen quite so quickly and easily. 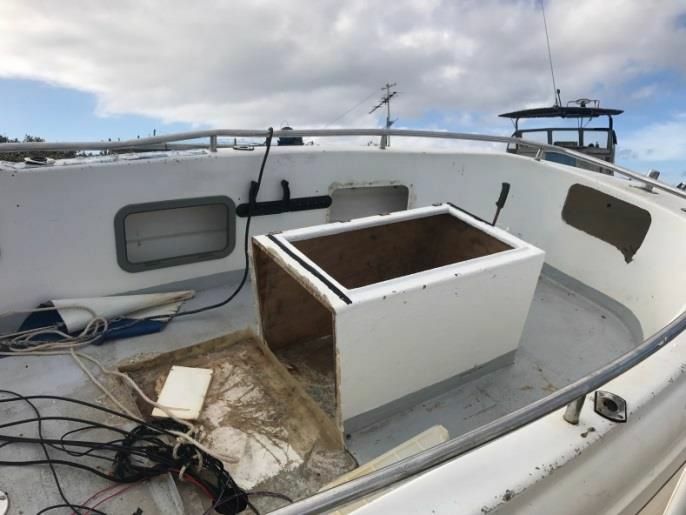 He told us he came across the yacht in the first few days after arriving in Darwin, made an offer, and snapped up this little beauty at a bargain price. His sailing plans were unsure, but Cape York for the wet season was mentioned, and back to the Kimberley for the dry next year is definitely on the cards. But he said one place he wont be going back to, except for a visit, was Silver Gull Creek. Many of our Kimberley Members will have fond memories of Phil and Marion. Having a beer with Phil under the shade trees of their tropical paradise was obligatory. Keep an eye out on the water for Scot Free II because I’m sure Phil will still be keen to share a story over a beer. 2014 Annual Beach Party a Great Success. Berkeley River Lodge Limo picked us up from the river mouth beach. Thanks again to the team at the Berkeley River Lodge for hosting our club’s only “organised” event. Then there was “Dolcinea” from Busselton, with David and his crew timing their cruise to arrive in the Berkeley specially for the party after 100 days at seas. Well done guys!!! A crew change flown into the Berkeley Lodge’s new airstrip saw them leaving the Berkeley later that week on the 100 day trip back to Busselton. 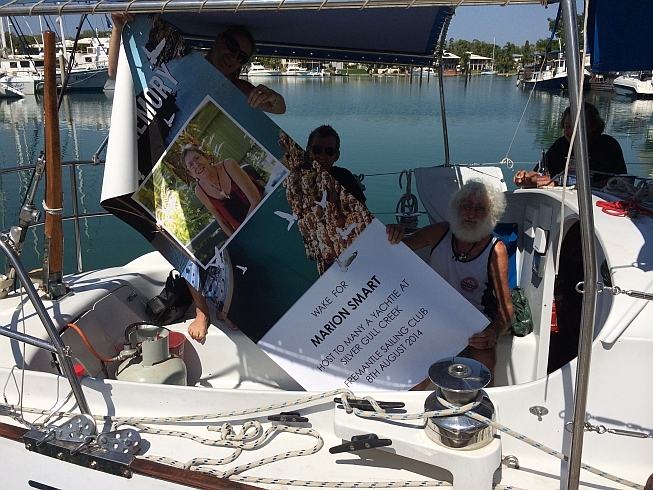 David is a very experienced Kimberley Coast sailing veteran, with many Kimberley trips under his keel. 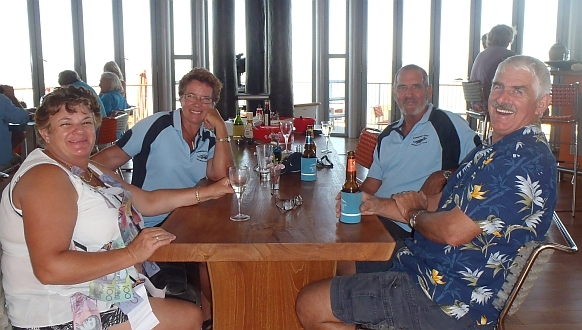 Experienced boaties, but Kimberley first timers, Graham and Ann were driving their alloy jet boat, “Leeuwin Current” from Queensland around to their home port of Geraldton. 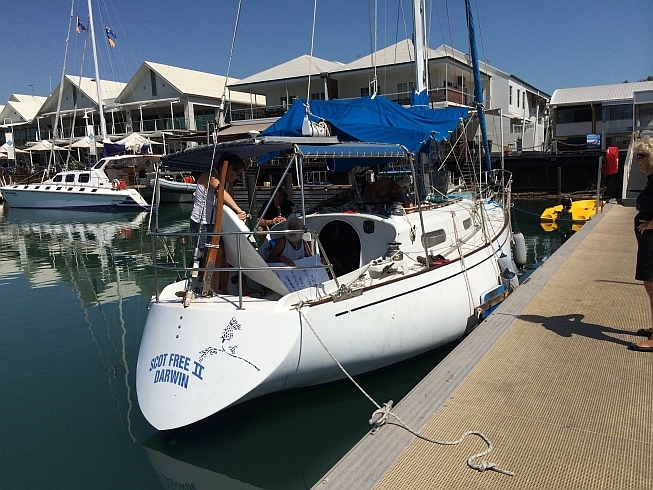 Philip and Dianne on their sailing cat “Selkie” are Kimberley veterans, first sailing there in 2000/2001. 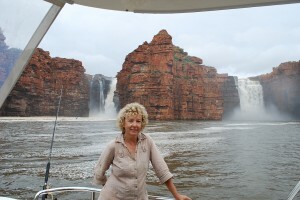 This was there last Kimberley adventure before they put “Selkie” on the market and change to land based travel. Donna and Peter are experienced world cruisers on their sailing cat “Two Up” who decided to see the Kimberley on their way home after a few years cruising Asian waters. Left to Right. Kim, Leslie, Peter, Rod, Roslyn and Ross – “R&R”. Martin – Owner of Berkeley Lodge. 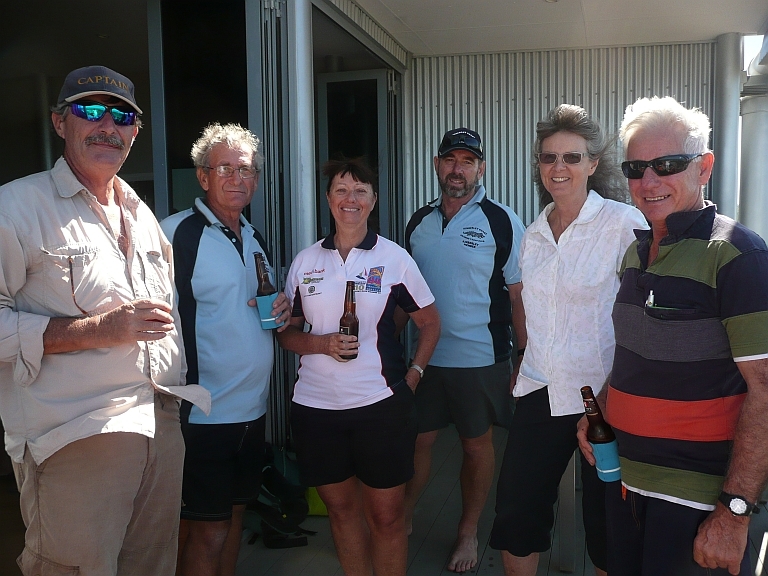 Roslyn and Ross off “R&R” also made good use of the Berkeley Lodge’s new air strip by flying in their friends from Kununurra for 12 days before flying them back to Kununurra from McGowan Island Camp in Napier Broome Bay. This takes the stress out of crossing the Blownapart Gulf with people on board who may not appreciate getting hammered by 25 – 30 knot Sou Easterlies. A great afternoon was had by all, new friendships were made, and much Kimberley Coast knowledge and information was exchanged among like minded people. A date for next year’s Fantastic Annual Beach Party will be announced early (ish) in the new year. I’m happy to receive suggested dates from Members. Molonga. Kellie, Glen and Indi. Two Up. Peter and Donna. Coolong. Gus, Vin, Darryl, Eric, Hayden and Helen. Getting Fuel on the Kimberley Coast for Your Vessel. Cruising vessels on the Kimberley Coast in 2014 need to let the fuel suppliers know they are coming. Contact them by phone before you leave Darwin or Broome and tell them roughly when you’ll be taking fuel and approximately how much fuel you will need. It’s also good practice to call them again about a week out from your ETA to confirm. I have heard through the grape vine that Paspaley Pearls may be supplying fuel from Kuri Bay again this year. This is not a certainty at this stage, but I’m hoping for confirmation around early May 2014. I will post it here and on the Forum pages when I know for sure. 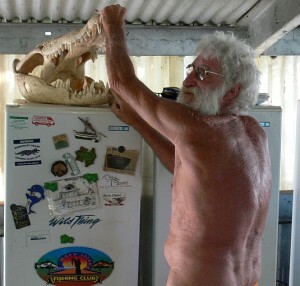 Crocodiles are are getting cheekier and more aggressive on the Kimberley Coast. Dinghy attacked, crew stranded. 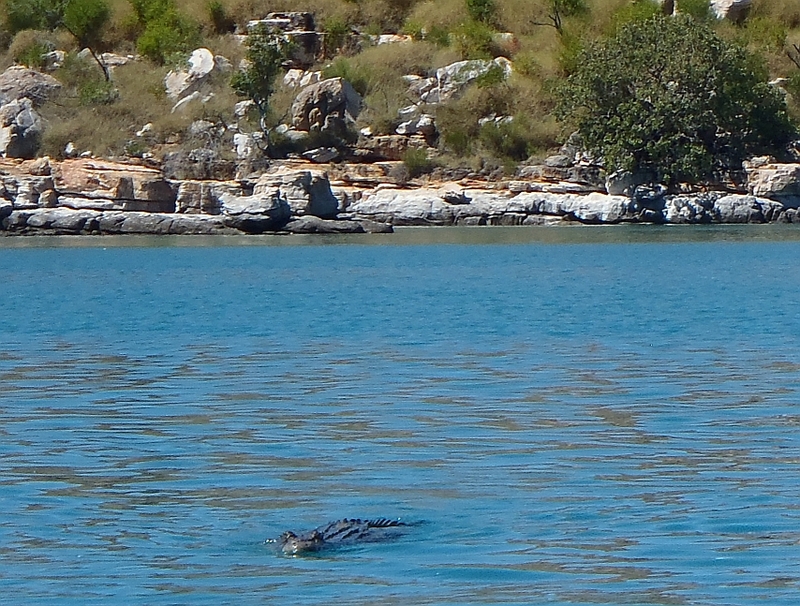 Two recent accounts of crocodiles stalking boaties on Kimberley Coast waters should serve as a warning to vessels cruising northern Australian waters. Rubber duckies, small dinghies and paddling craft such as kayaks are not suitable as tenders in this area. This monster 6M croc followed the writer’s dinghy in Mudge Bay 2013. 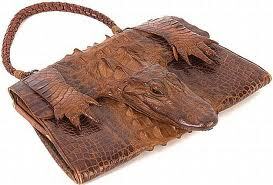 Possibly the same croc in the Water Pipe Bay incident. This might be a good time to remind people heading to the Kimberley coast about the importance of always taking a small, cheap, personal EPIRB and a hand held VHF radio with them when they go ashore, or leave their mother vessel in a tender for any reason. Two other separate incidents of crocodiles stalking small craft happened within days of each other on the Governor Islands and in the Drysdale River late in the 2012 dry season. On both occasions, Don MacLeod from Don’s Camp in the Drysdale River, rescued the people involved. ABC News reported these incidents at the time. Click here for the ABC report. The “General Information” leaflet in the Anchorage pages of this web site has information and strategies related to safety around crocodiles. It’s getting closer to the 2014, KCCYC 3rd Annual Beach Party at the Berkeley River. We’ve chosen the 30th of June as the date for this year’s spectacular event. Handbag Security Services have informed me that its been a “big wet” this year and they’ve added a few extra staff members to keep things under control. Please be aware, they wont hesitate to put the bite on anyone who over indulges and falls out of their dinghy, as was the case last year with one party goer. Fortunately, the HSS guys were looking the other way at the time. Our usual elitist, strict dress code will be enforced without question. This is a fashionista event, and under dressing for this sumptuous occasion will not be tolerated. Members are expected to dress formally in the club polo wear, and other guests are expected to wear something clean at least, perhaps in a Tax Office employee theme – that’s bound to go down well! Like last year, its impossible to predict how many boats will be there. But the word is out about how great last year’s party was, and I know there are a few southern based boat crews planning their whole life around being there. I’ve also heard the scuttlebutt that some of Darwin’s most influential movers, shakers and socialites are making room in their busy schedules to travel across the Blownapart Gulf. There’s also talk that a few Easterners are changing their cruising plans to be there for this end of FY2014 extravaganza celebration. I’m predicting/guessing around 10 vessels or more will make it this year, and hopefully a new world record for attendance will be set. Our motto of “disorganization will be the key to this event” has been thrown out the door with my GST returns. This year I actually contacted Leith at the fabulous Berkeley River Lodge Resort to get the word in advance as to whether we will be able to use the Lodge’s Bar and Bar BQ for this grand gathering. Obviously, he was absolutely ecstatic at the prospect of hosting the KCCYC elite once again. Because we get to use the Lodge’s bar facilities, the tradition is that one of our well healed secret sponsors will cough up for the first $500 worth of tax deductible drinks. 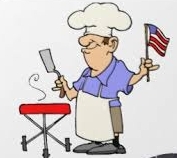 And I’m sure the Lodge will have their Bar BQ white hot and ready for us to cook our BYO steaks and snaggers, to go with the salad your deck hand brings along to share. The dining tables will be set in silver service standard, so there’s no need for you to raid your galley for the plastic cutlery and paper plates. It will be a lunch time and afternoon affair, purely because we don’t want party goers to be heading home in their dinghies after dark and tangle with the boys and girls from HSS. 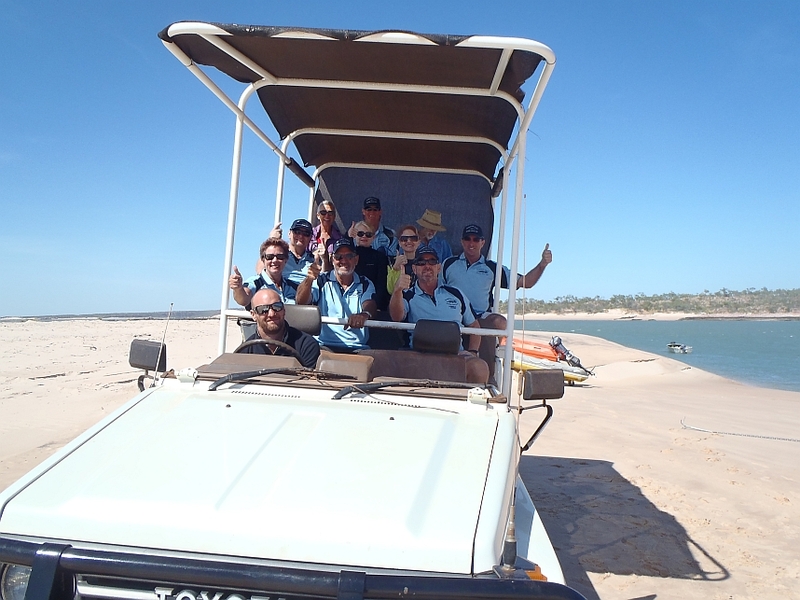 Leith and his friendly team from the Lodge will pick us up in the Toyota, Kimberley Style Stretch Limo at around 1130 hours at the beach just inside the river mouth. Phil and Marion Call it a Day at Squatters Arms. 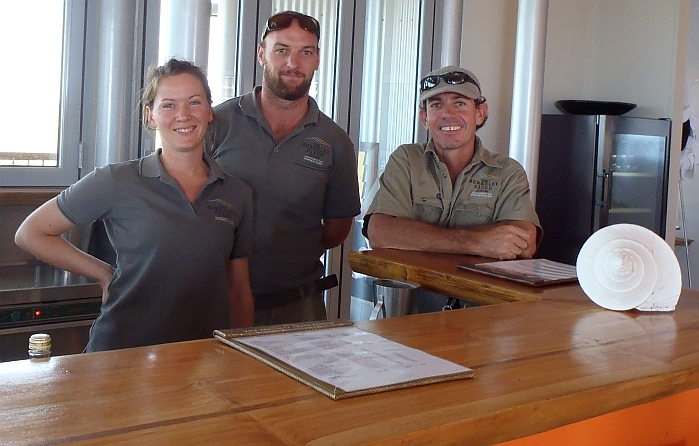 Most visitors to the Squatters Arms in Silver Gull Creek, located on the isolated West Kimberley Coast, describe it in terms such as “a little piece of paradise” and “heaven on earth”. Why would you retire from paradise? Most of us bury our pets in the back yard. Not Phil!! services we all start to need for our health and wellbeing when we get to “retirement age”. 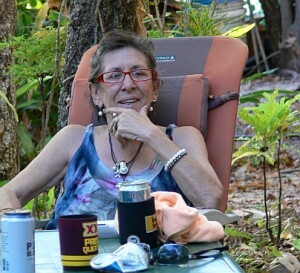 After nearly 20 years living in paradise, Phil and Marion have “retired”. Derby is now their new home, where they are house sitting for good friends, Shelley and Mal. 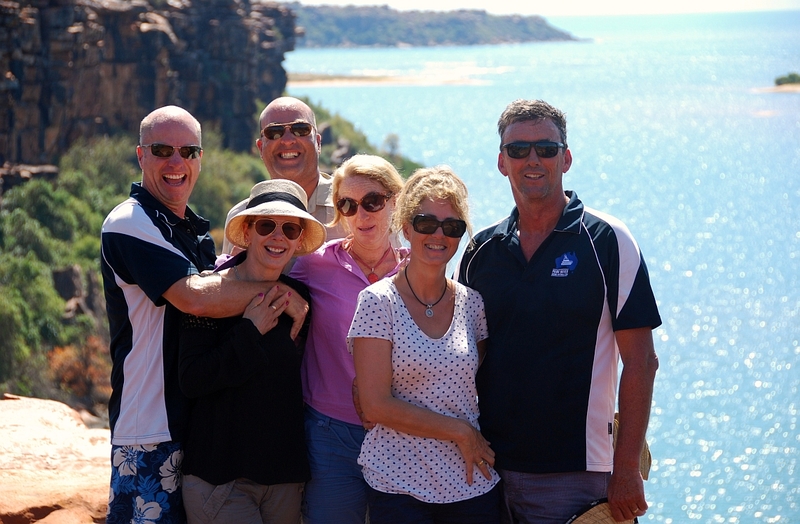 Phil and Marion were the first “Kimberley Characters” we met on our first cruise through the Kimberley Coast in 2007 – they are also the most memorable. Since then, Ros and I have been back several times to drop in for a beer, a meal, a swim in the tank, and most importantly, a happy and colourful conversation with these two carefree and joyful people. 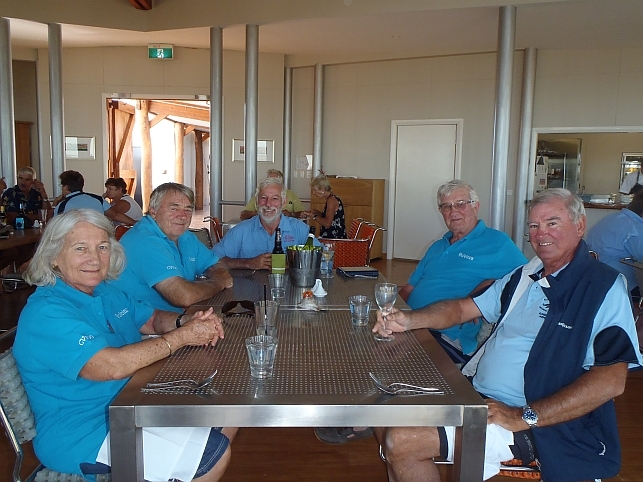 They were also among the first “Kimberley Members” to join the Kimberley Coast Cruising Yacht Club. 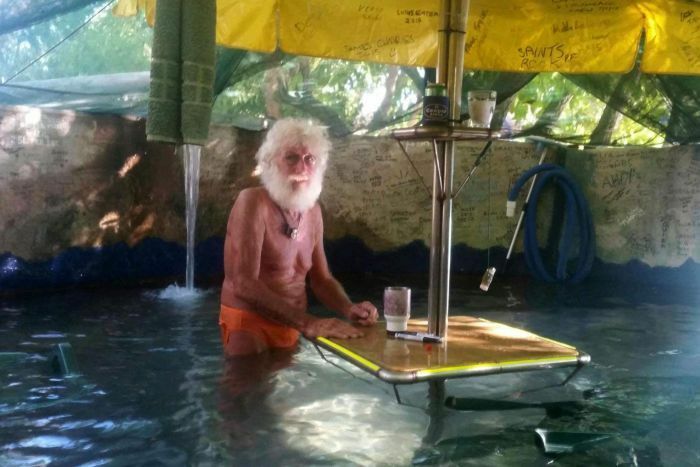 Many thousands of cruising yachties, charter boat punters and crew from around the world have visited the Squatters Arms over the years, and I would bet that for most, the visit to Phil and Marion’s place is the story they most tell their friends about their cruise to the Kimberley coast. Those of you that have been to Silver Gull Creek will know what a great place it is, and what an extraordinary pair Phil and Marion are. For those who have yet to get there, all is not lost, because Shelley and Mal have taken on the enviable mission of reverse house sitting at Silver Gull Creek. When you get there, call them on VHF 16 before heading up the creek for a visit. Crew from “R&R” and landing barge “Yampi Sound” enjoying an afternoon in the shade, a beer and a few stories with Marion and Phil at The Squatters Arms. On behalf all the members in the KCCYC, I wish Phil and Marion all the very best in their next stage of life in Derby, and thank them for the fun, laughs and great times had by many cruising yachties at the Squatters Arms. Update on the Camden Sound Marine Park. Click here for a copy of the latest update newsletter from West Australian Fisheries and Dept of Wildlife on the Camden Sound Marine Park, which had now been renamed Lalang-garram/Camden Sound Marine Park. This mother Humpback and her calf would have been very difficult to photograph from 500 meters away. 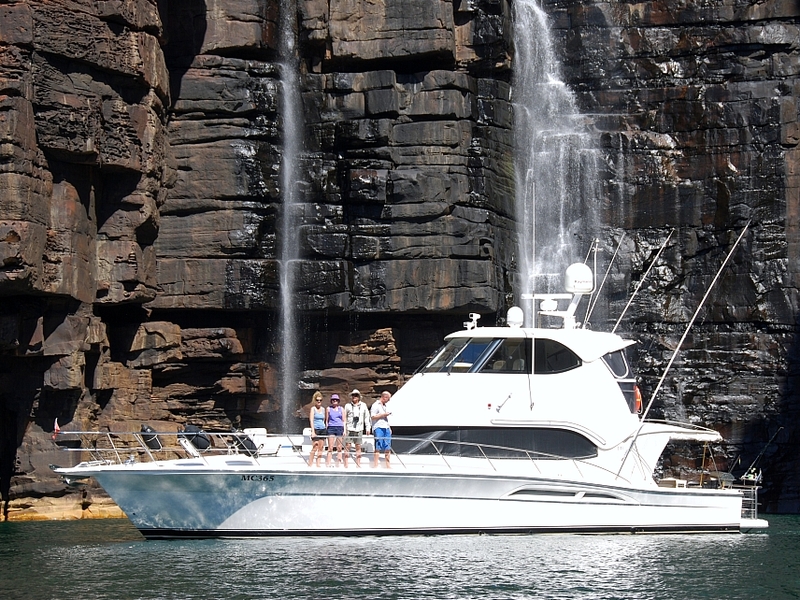 The newsletter is aimed at the charter operators cruising and fishing in Kimberley waters, but the rules are the same for private cruising vessels. I note that they have softened their rules related to whale watching and interaction. It has changed to vessels not approaching a mother and calf closer than 500 meters, and if the whales close on the vessel, the vessel must remain in neutral. Previously, the proposed rule was that vessels had to move away and maintain minimum 500 meters from the whales if the whales approached the vessel. The new rule also makes specific mention of the whales being a mother and calf. This leaves it a little unclear as to whether or not you can approach a single adult whale up to 100 meters (as the rules currently allow). There are hundreds of Humpback Whales, including mothers and calves, scattered throughout Kimberley waters from about July through to October; they don’t just stay in the proposed new marine park. This begs the question. Do the same rules apply outside the park, or can these whales be approached up to 100 meters? Lets hope the 100 meter rule stays for whales outside the park, because from my experience, looking at a whale from half a kilometer away is a waste of time. 2013 KCCYC Annual Beach Party – a Major Success Story. We expected 5 yachts to show up to the 2013 KCCYC Annual Beach Party at the Berkeley Lodge on 10th July , but “Get This” we set a new world record for the Annual Beach Party attendance – 8 yachts, totalling 23 crew, plus the Lodge staff and half a dozen bewildered guests that were staying at the Lodge. A big thanks to Martin and Kim Pierson-Jones for allowing us to use The Berkeley Lodge facilities. The 25 knot south easterly blowing straight into the river mouth, made for an interesting mile long dinghy trip from the spot where most yachts decided to drop the pick for the day. But all the illustrious and superbly attired guests arrived safely on the beach. But one of “R&R’s” crew, Vince, got a little more wet than others, after falling on his bum while stepping out of the dinghy. 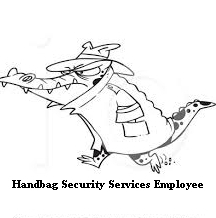 Thankfully, Handbag Security Services, River Rescue Team was not required. Ever vigilant, quite a few of their employees were spotted at various security check points along the river banks this year. 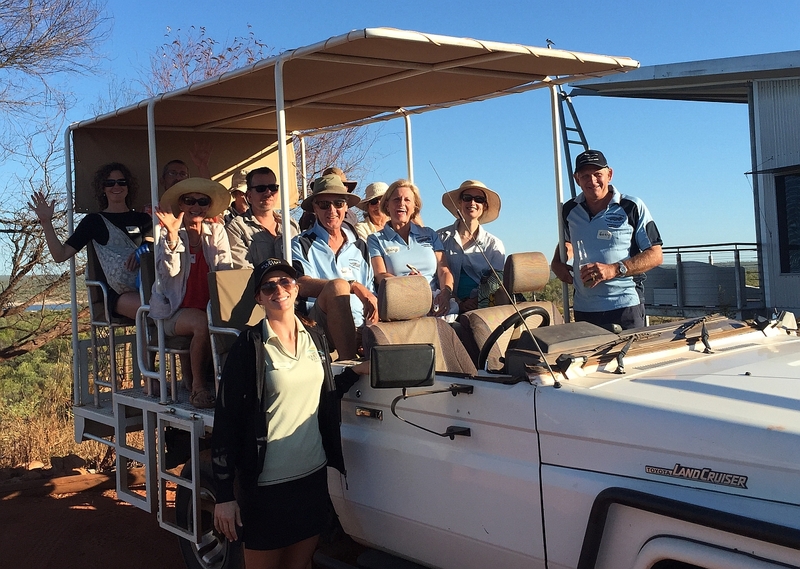 The Berkeley Lodge’s “Troopy” chauffeured the party goers up the hill to the Lodge. It’s believed that Toyota will soon offer the “Verandah” as a standard option. The Berkeley Lodge’s modified “Troopy” chauffeured us up to the bar and restaurant in the best of Kimberley style transport, where a great afternoon was had by all. 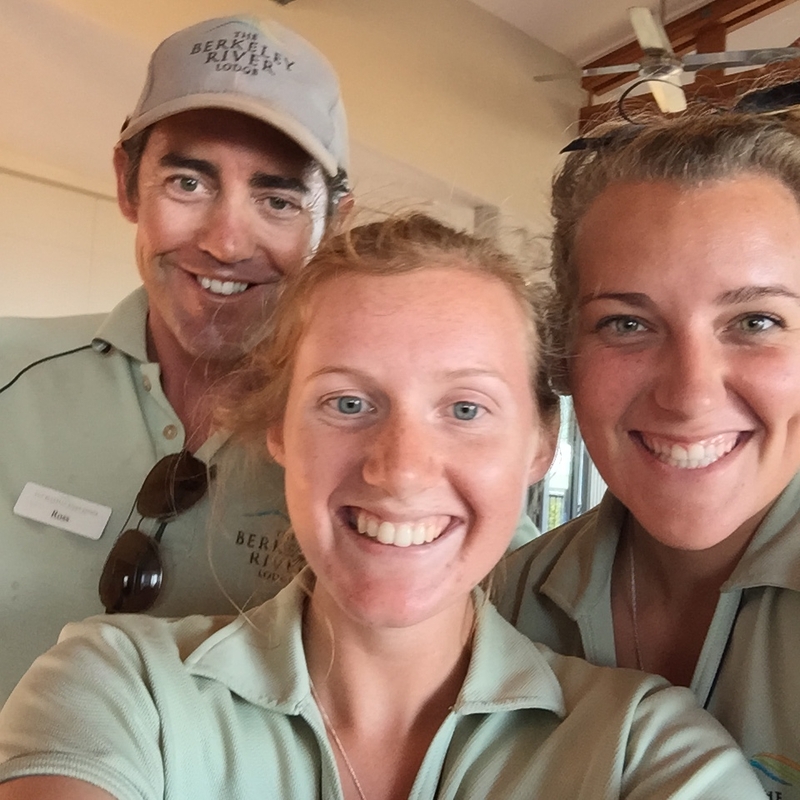 Three of the great staff at the Lodge. Leith (Manager) in the middle. 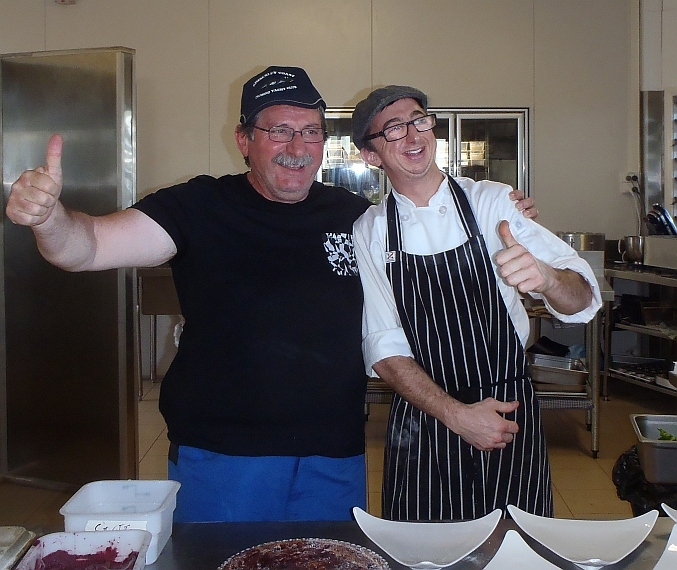 Vince “The Prince of Flesh” Garreffa helmed the Bar BQ with his usual flare and style, and everyone enjoyed the Matso’s Brewery beers and excellent wines served up by Leith and his dazzlingly efficient team at the Lodge. A special thanks to “Chef”, who baked up a gourmet desert on a moment’s notice. It was worthy of a Master Chef TV series in its own right. 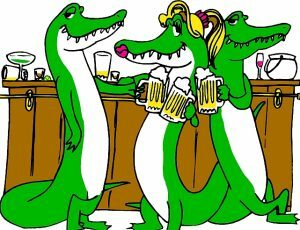 As is usual when a bunch of yachties meet in a bar, much well meaning advice, stories involving exceptionally huge seas and enormous fish, along with opinions on the best Kimberley anchorages to stay at, and rocks to stay away from, were freely bandied around. 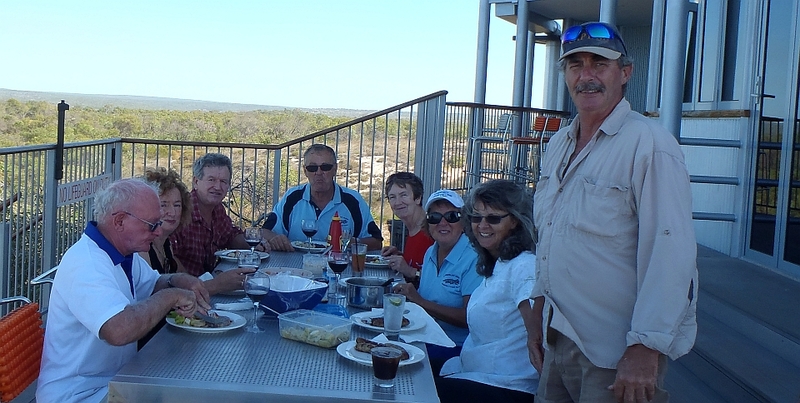 Hopefully, the Kimberley first timers went away with some valuable information that enhanced their Kimberley coast cruise. I’m already getting Members and web site guests asking about the date for next year’s “Fantastic, Out of This World, KCCYC Annual Beach Party”. In keeping with the tradition of the almost total lack of organisation that goes into this magnificent event, I’v got no idea when it will be. 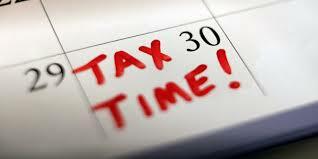 But at this stage, block out the second week in July 2014 in your calendar, as a likely timetable. I’ll keep you posted!!! If you have any news or events that may be of interest to members you would like to publish on this page, please go to the contact page and email the details to us.